Pennsylvania is abundant with outdoor activities. Smallmouth bass fishing is one of them that can really bring you joy. If you are looking for a true adventure this fall, make sure way to Erie, PA where you can get hooked up on a variety of bass species. A Pennsylvania bass fishing charter is all you need to have a great time on the water with your friends or family. Our local experts have spent years fishing this beautiful lake. Lake Erie is quite large and you need to know everything about the lake in order to have success. Captain Mark Rose focuses his efforts and fishing out of Erie, PA. Presque Isle Bay is a great location to experience Lake Erie. Capt Mark Rose had the pleasure of fishing with Mark and Zack Wilson. They were traveling from Ohio to experience the other side of Lake Erie. Late fall weather has sunken in and it is starting to get colder by the day. One thing the colder weather does not affect is the bass fishing. If you can adore and be prepared for a little chill, you can have the adventure of a lifetime. Lake Erie really produced on this fishing trip. You don’t always get to experience all the different species when fishing here. Mark and Zack caught 5 different species. They caught some quality numbers of smallmouth bass along with largemouth bass, white bass, perch and drum. The only species they were missing was a walleye. It was a quick 6 hour fishing trip with all the action. A drop in water temperature to 65 degrees has caused the fish to start to move. This is a good thing for the bass fishing here on Lake Erie. If you are looking to cash in on the action before winter sets, now is your time. The best spots to catch bass this time of year was from the chute of the bay to the hammermill plant. Captain Mark is looking forward to fishing with Mark and Zack again in the future. They will be back for more of this incredible action! Don’t miss out on your fishing adventure next time visiting Pennsylvania. Smallmouth Bass fishing is a great outdoor experience. You can have a lot of fun this fall. Plan your fishing trip today and let’s get hooked up. We look forward to seeing you on the water next time! 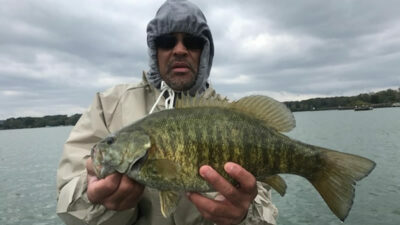 If you enjoyed this post about Lake Erie Smallmouth Bass, you might also enjoy other Lake Erie Fishing Reports from the same area. Don’t forget to follow us on Facebook, YouTube, Twitter and Instagram. Capt. Mark Rose hometown is Pittsburgh PA. Mark has been fishing Lake Erie and Lake Okeechobee since 1999. He fishes Lake Erie in the spring for smallmouth. He runs a detail shop in his hometown during the summer, spring and fall and heads to Florida during the winter months to do what he loves, guide on Lake Okeechobee.